Emergency Fire, Division of USA and Train Journey. The dream then changed and I was in one of the rooms in the building which appeared to a commercial kitchen of some sort. We were singing songs together and I was playing drums with my hands on the kitchen benches (kitchen counters for the USA folk). I also recall chatting with a couple of women there and we were talking about a train journey they had been on which travelled along the northern border of the USA from west to east just near Canada. The strange thing about this discussion was that once the train got nearer to where New York would be, everything was barren and void of population and the landscape had changed significantly both geographically and oceanically. There were large areas of water inland in what would've been the area from South Carolina through Tennessee, Missouri and up to South Dakota. North Dakota was still as it is now. Everything to the east of that new area of water had become barren mountains. After that, I left the kitchen and had to catch a train. I remember having to use an elevator at this point to exit the room I was in. This elevator was quite strange. It moved VERY quickly and didn't stop for very long. Also, on it's door was an area in the middle where you place your hand to open the door. The area was like an indented imprint of a hand. It was difficult to get the timing right due to the extremely short amount of time the elevator remained stationary before it left. 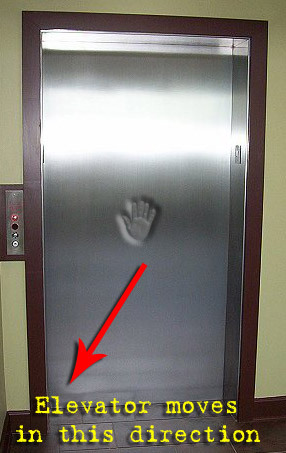 Another very peculiar thing about this elevator was that it moved diagonally. The exit was one floor lower than the room I was in. Once I got out of the elevator, I was at the train platforms but I didn't know which platform the train left from, nor did I know what time the last train was so I searched for somebody to ask and found the lady in charge. She told me she was about to announce the last train leaving over the station PA system. She went inside a little office and announced that the last train was leaving in five minutes at 11pm from platform four. I had one of my music synthesizers under one arm and my backpack, laptop (with my music and communications stuff on it) and a few other things I needed for the journey so I couldn't run fast but I hurried to the platform as quickly as I could. As I got there, I saw two trains and one was leaving so I initially thought I'd just missed my train. However, somebody told me that the train that was just leaving wasn't my train but the bigger one just next to it was the one I needed to catch. Hey Sister, I had to run here and post this! This brother had almost the same vision you did - with the crack and water of the States!!! Last edited by solaris; 24th January 2011 at 02:45 AM. Wow sis!! Thank you for posting that video. There is a 1700 mile crack across the USA, although not straight as in the above gif. It is undoubtedly no accident that it is shaped like a sword. Analysis of gravity measurements, using computer techniques developed for processing data from Mars, has revealed an ancient inactive rift deep in the North American crust that may extend 1,700 miles from Idaho to the southern Appalachians. It appears to be at least twice the length of the San Andreas Fault in California. Scientists said the discovery could contribute to a better understanding of the origin of the crust and of the forces responsible for the many earthquakes that have shaken the Mississippi River valley in southern Missouri, Kentucky and Tennessee. 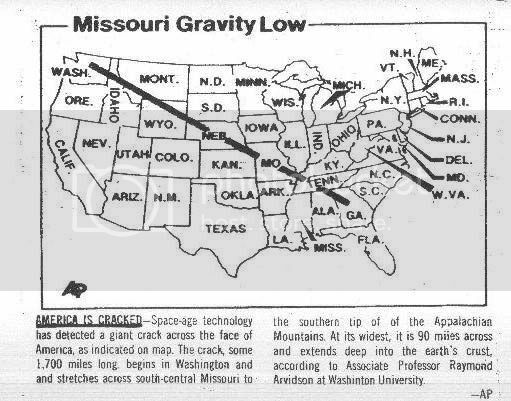 The rift intersects an active fault south of New Madrid, Mo., epicenter of a devastating earthquake in 1811 that changed the course of the Mississippi. However, the rift poses no known threat because of its inactivity. Scientists suggested that the new technology may disclose many such features near the surface of the earth. The feature might be a ''shear zone'' formed by the collision of two land masses more than 200 million years ago, the event that closed the proto-Atlantic Ocean in the joining of all continental fragments into one supercontinent, Pangaea. The same collision caused a buckling of crustal material that produced the Appalachians. Or the feature might be the track left over millions of years ago as the earth's crust rotated over a stationary ''hot spot'' deep inside it. A similar hot spot is believed to be the source of the volcanic activity that produced the Hawaiian Islands in sequence over hundreds of thousands of years. going through the Reelfoot at New Madrid up the St. Lawrence Seaway. Each leg is approximately 120 degrees from the other and is called an Aulacogen. This is important because if the American plate was not divided by the 1811-12 quakes, then it fits the description. In geology, an aulacogen is a failed arm of a triple junction of a plate tectonics rift system. A triple junction beneath a continental plate initiates a three way breakup of the continental plate. As the continental break-up develops one of the three spreading ridges typically fails or stops spreading. The resulting failed rift is called an aulacogen and becomes a filled graben within the continent. The term "aulacogen" is derived from the Greek aulax (furrow) and was suggested by the Soviet geologist Nicholas Shatski in 1946. The crust in an aulacogen region remains weakened by previous rifting activity and thus seismic activity and, occasionally, volcanic activity may re-occur subsequently from time to time. As aulacogens remain places of weakness, given the appropriate conditions, they can reactivate into active rift valleys again, as had happened to the Ottawa-Bonnechere Graben in Ontario and Quebec, Canada, an ancient aulacogen that reactivated during the breakup of Pangaea. 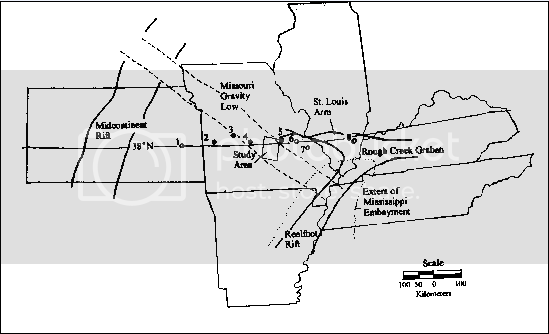 The Mississippi embayment with the associated New Madrid Seismic Zone is an example of an ancient aulacogen that dates back to the breakup of the ancient continent Rodinia. This ancient rift was the site of extreme earthquakes in the early 19th century in what is now the central U.S. The Rio Grande Rift is another example. On the Southwestern European margin (offshore Portugal) is located another abandoned rift basin (Lusitanian Basin) that evolved at the same time as the Canadian Grand Banks region, where the Hibernia Oil Field is located. Scientists discover big rift, 1700 miles long, across U.S. Scientist find continental 'rift' across face of U.S. Here is another from David showing his estimation of where the "crack" runs. This info is from dead URLS at another board which is not Christian friendly. David is a Christian. Wow this is an interesting find! I've just started following prophecy about 4 months ago and find it fascinating. It's amazing the puzzle pieces out there. Thank you Teshuvah for sharing this information. There's certainly a lot of eye opening stuff amidst your posts which heightens my urgency with the posting of this dream. I have no idea how or when this might be fulfilled but it certainly seems somewhat imminent, particularly given the recent and ongoing seismic activity in those regions. Something I want to stress is that the last thing I want is for people to react in fear to any of this. As always, it is critical that we always seek the guidance and direction of Jesus. He knows how and when things will play out and He has a purpose and place for all His people. I personally believe all seismic zones are potentially active (or at least laying dormant) rather than extinct as the secular scientific community often claims. They also claim the earth is millions (or sometimes billions) of years old. As a relatively new Christian who has studied science in detail most of my life, I reject this assumption often wrongly based on flawed observation devoid of biblical foundation. I USED to believe the old earth theories before I was born again and had my eyes opened by the Holy Spirit but then again, I also used to believe evolution was true based on the brainwashing from our 'education' system. Clearly though, I have no intent of throwing the baby out with the bathwater and I DO accept a fair portion of secular scientific research as legitimate. I simply view it through a Christian lens these days...... and it makes FAR more sense from a scientific perspective that way too!!! Thank you Teshuvah for sharing this information. You are most welcome. I have a lot more info and will post it later. Fear is a useful tool God uses to move people to do things and go places. Most prophets put the fear of God into people and that is why they were killed. However, fear can be a good thing. See the 18 instances in the Bible where God told people to flee . Big earth movements are not limited to times of old. They could happen again in a far bigger way than before. Ge 10:25 And unto Eber were born two sons: the name of one was Peleg;* for in his days was the earth divided; and his brother's name was Joktan. *Pegeg means earthquake and this verse says the earth was divided. If the United States is Great Babylon of Jer 50 51 and Mystery Babylon of Rev 17 & 18, these verses serve to warn people to move before major events happen. If your house is on fire and someone warns you to leave and you don't, then your death is on your own head. Faith requires action. Jas 2:26 For as the body without the spirit is dead, so faith without works is dead also. Too many claim God will protect them when they could use a little God-given common sense and flee. The unbelieving do nothing. 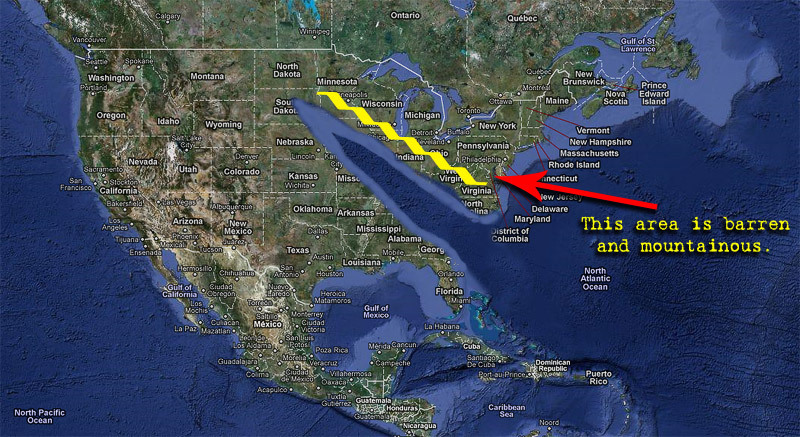 Three major fault systems form a triangle over the United States. These may be the "pieces" above because if any huge quake occurred on one leg of this triangle, it may impact the other two legs in a domino effect. That may be why some have had dreams or visions of huge quakes on two legs of this triangle. Leg One: The Arvidson as shown in above posts. Leg Two: Off the Washington and Oregon coast is the Juan de Fuca Plate which is subducting under those two states making for the potential of an enormous quake at some time in the future. 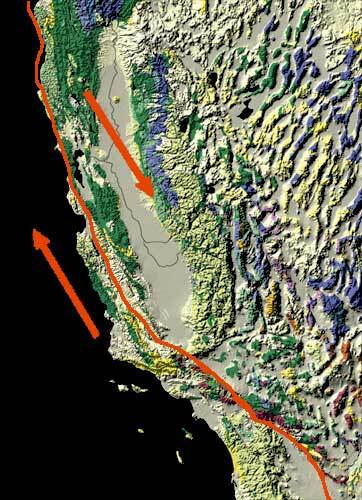 Off Southern Oregon it is met by the Gorda Plate which goes down and meets the San Andreas Fault in California. Leg Three: Just South and East of Bakersfield, California, there is a fault system called the White Wolf and Garlock Fault which are SW-NE trending as is often the case in California and where there are frequently lines of quakes. The Garlock meets or crosses the San Andreas. If you extend that Garlock fault towards the NE and look at it on a large topographical map, you will see you can trace it from California to where it crosses the Arvidson, which you can also see, and goes on to the finger of Lake Superior. Download one of these topo maps below * and see for yourself. Note the file sizes. I recommend the 1 minute/pixel map. Turn off the selection in your browser to View Image in Window then you can scroll around the country or you can toggle back and forth. The trace is visible. 30 seconds/pixel (6636 by 3556 pixels, 9.3 MBytes). 2 minutes/pixel (1638 by 861 pixels, 1.1 MBytes). miniature (655 by 345 pixels, 186 KBytes). full resolution PNG (6636 by 3556 pixels, 25 MBytes). The writer John McPhee once sat in Lovelock, Nevada, as geologist Kenneth Deffeyes told him that tectonic movements in the American West are opening a new arm of the Pacific Ocean. He said it will reach, over the next few tens of thousands of years, all the way into Nevada. Deffeyes sketched the future sea on the map, extending from the Gulf of California through Death Valley and beyond to Lovelock. I completely agree with you. Perhaps I should clarify that the meaning of my previous statement on fear was about needless and disorganised panic as opposed to holy fear of God which is absolutely essential and sadly lacking in many who claim to be Christian these days.